Some of Al Capone's down time. Al Capone and Frank Rio are arrested at movie theater for gun posession. 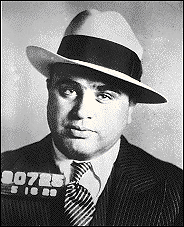 Some claim the fix was in and that Capone was avoiding retaliation for the St. Valentine's day massacre. Others stated he was doing this to appease his peers in other cities, this, in order to remove the government's spotlight on organized crime. In reality, Capone had nothing to fear from Moran because they had just signed a peace treaty avoiding all retribution for past indiscretions. According to Jake Guzik, the arrest was simply a double-cross by police, a way of the law thumbing their noses at Capone and company. 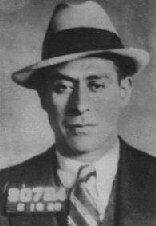 Capone had told Guzik that the fix thing rumors were bunk and that after they left Atlantic City and reached Philidelphia, their (he and Rio's) automobile just broke down. They planned to take a train out of Philly. The train was at a much later time, so they decided to take in a movie just to kill some time. Frank Nitto was supposed to go down and meet them, but doubled back once the pair was arrested. The detectives, who were there on other police business, just happened to catch sight of Capone in the theater lobby and immediately arrested him and Rio. They told Capone and Rio to plead guilty and reassured them that the judge would just slap them on the wrists for that minor offence and that they would be on their way home. The opposite of that happened as the detectives knew full well that Capone and his cohort would do time for this particular offence. Capone's own story was plausible because he was to meet with his friend Harry Read on the 16th of May for dinner at The Lexington Hotel. This was later confirmed by Read. Capone's arrest was a bad thing for Chicago because as soon as he went to jail, the gang violence had started right up again. 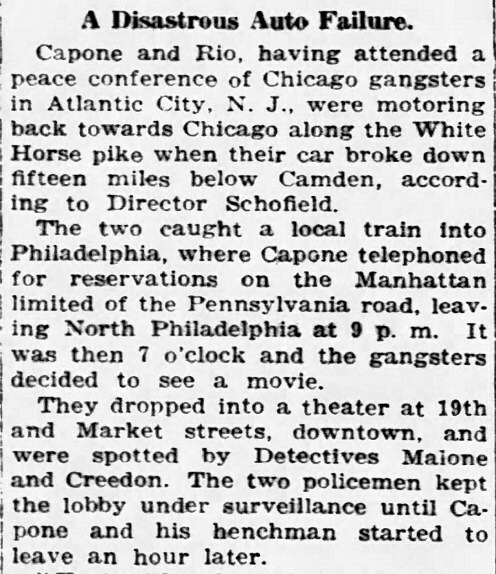 Aiello, Moran and Zuta took advantage of Capone being kept at bay in Philly. 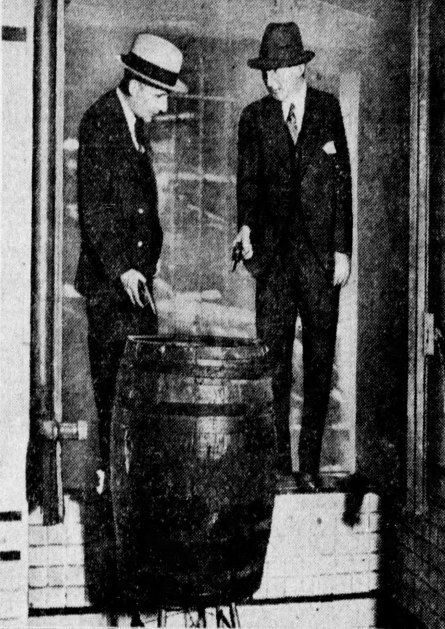 James “Shoey” Malone and John “Jack” Creedon shooting Al Capone and Frank Rio's seized .38 caliber weapons into a barrel of waste. The slugs were kept for ballistics comparison. The Lincoln Journal Star June 3, 1929. Al Capone and Frankie Rio mugshots in Philadelphia. (Mugshots taken on May 16, 1929). 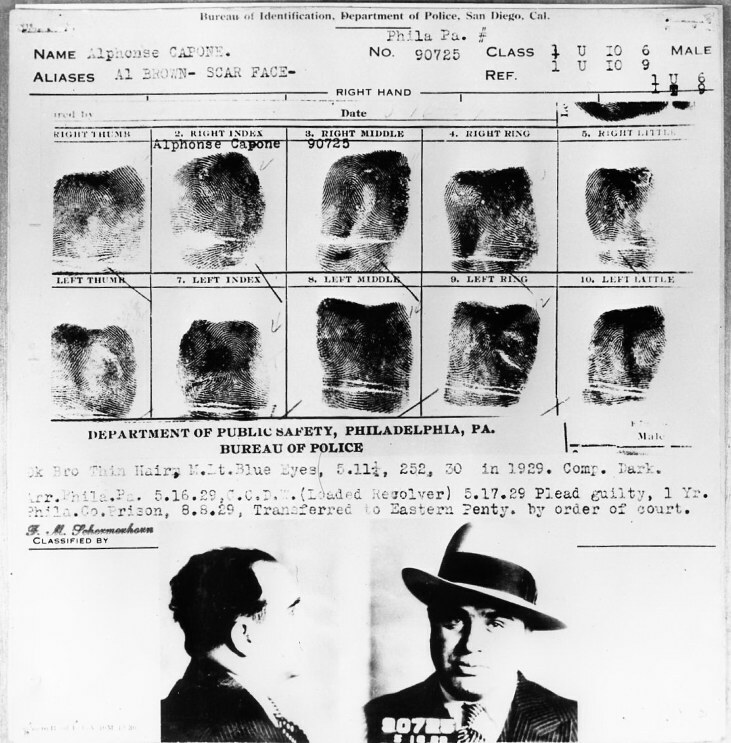 Al Capone and Frank Rio are arrested on May 16, 1929, at Stanley Theater in Philadelphia. 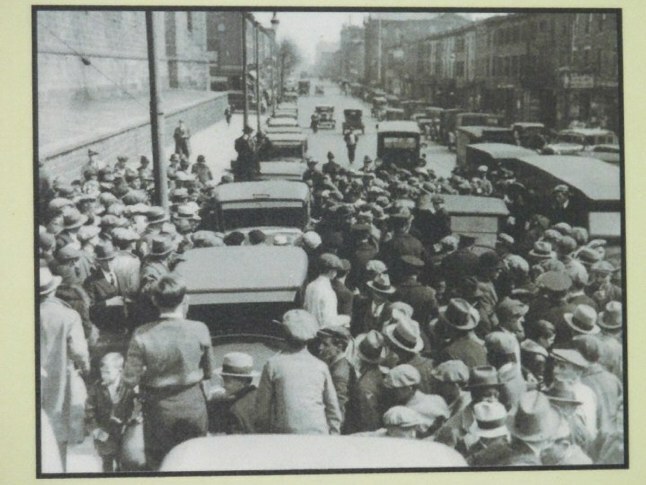 They will be sentenced to one year in jail on May 17, 1929. This was called quick Quaker justice in the newspapers because it took less then half a day from the arrest to the sentencing. Many believe the fix was in because Al knew the arresting detective previously in Florida. There was talk that Al needed a rest from gangland could have the best protection from enemies in his private jail cell with his bodyguard in an adjoining one. He was also hoping this would help tone down the uproar created by the St. Valentine's day Massacre. 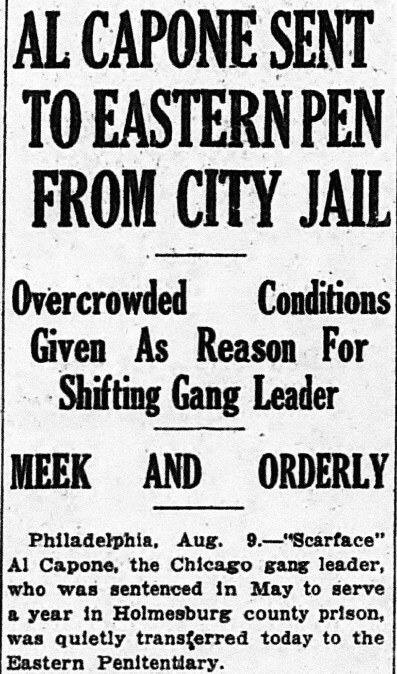 After their arrest Capone and Rio are taken to Moyamensing prison and are then transferred a day or two later to Holmesburg County prison. 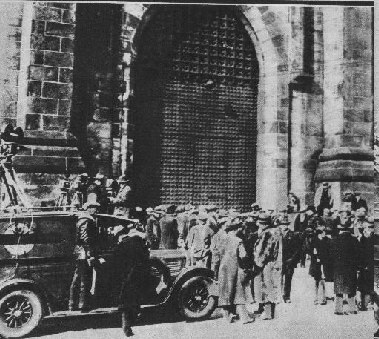 They will be transferred again to their final destination at the Eastern State Penitentiary on August 9,1929. May 17,1929. 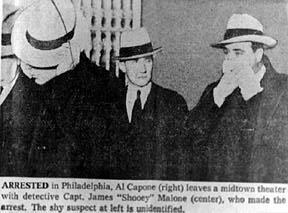 Al Capone with hat standing next to his arresting officers (Creedon and Malone) in a Philadelphia court. He is sentenced to 1 year in prison. Mae staying with relatives which was her sister Agnes who at the time lived in Mountainside, New Jersey. 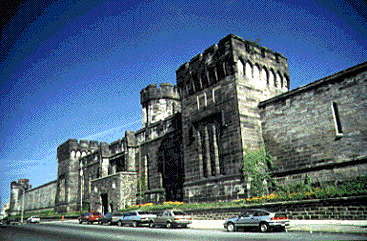 Al is later transferred in August 1929 to Eastern State Penitentiary. 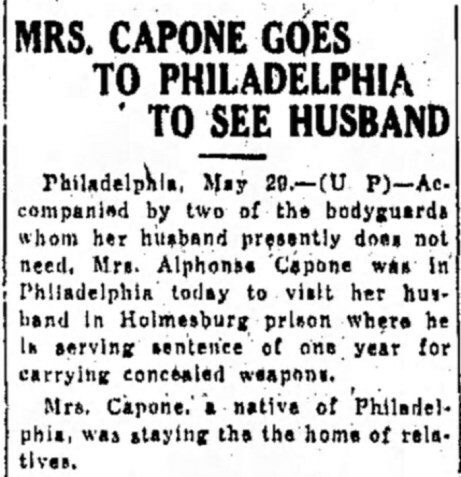 The travel distance and time remain about the same for Mae to visit Al from her sister's home in Mountainside, N.J. (The Courier Express May 30,1929). Al's transfer from Holmesburg to Eastern State. (The Evening News August 9,1929). 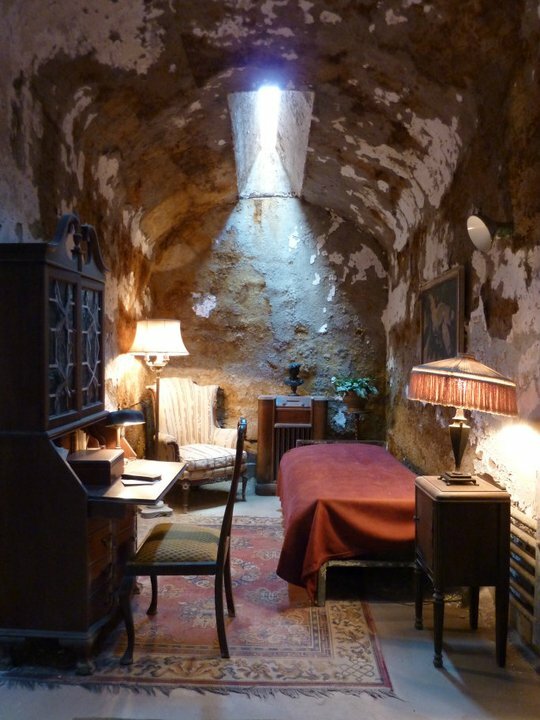 Al Capone's cell at Eastern State Penitentiary is a main attraction for many who visit there. 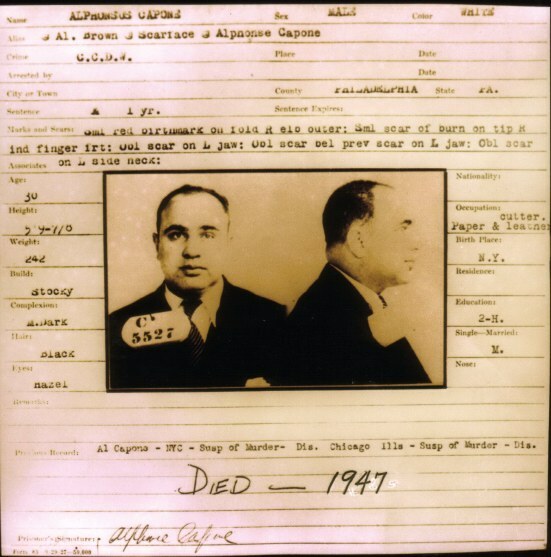 Al took a powder and served a year after the Atlantic city gangster conference. 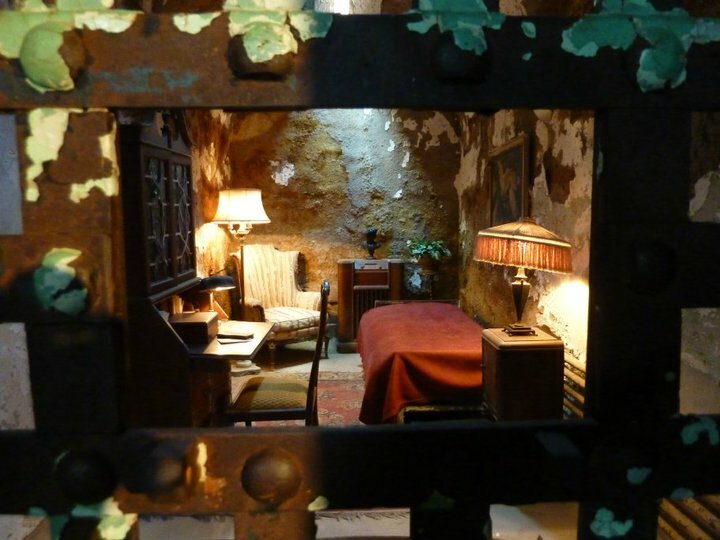 Eastern State Penitentiary i.d. card. (Taken from novelty postcard on knick knacks page. Copyright Eastern State Penitentiary). Photo from outside Al's old cell. 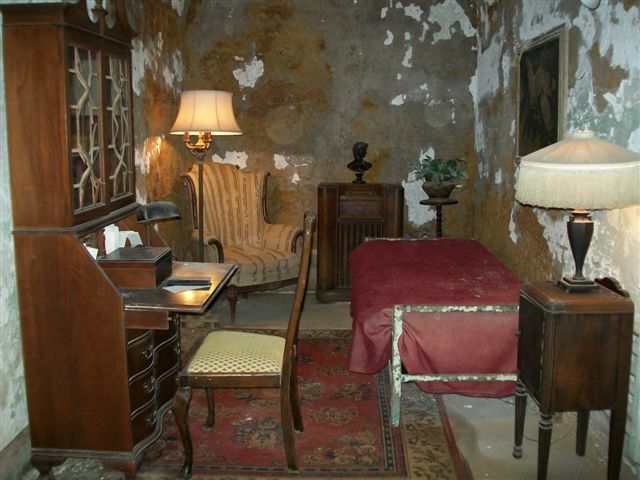 Al's jail cell at the old Eastern Penitentiary in Philadelphia.The cell still stands today and according to Eastern State it is furnished every year exactly as Al had it when he was incarcerated there. This may have not been an accurate description and simply made up by the press. The Bismarck Tribune September 5, 1929. According to this story, the cell wasn't as accurate as the photos shown above and Al had the minimum as far as furnishings. Reporters including Jake Lingle were waiting for Al to be released. Al was already enroute to Chicago when this photo was taken much to the dismay of these reporters. 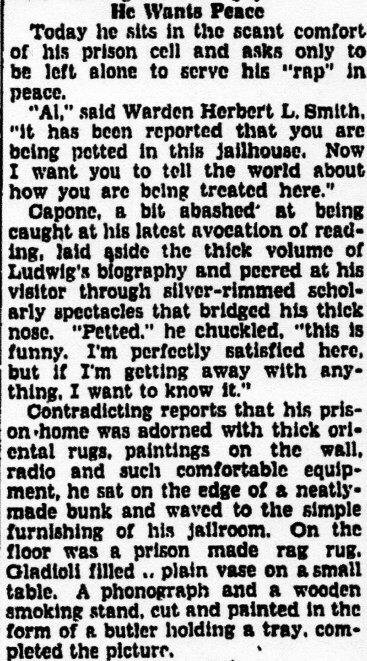 Capone avoided Lingle because Lingle was courting Capone's rivals in order to make money for himself. 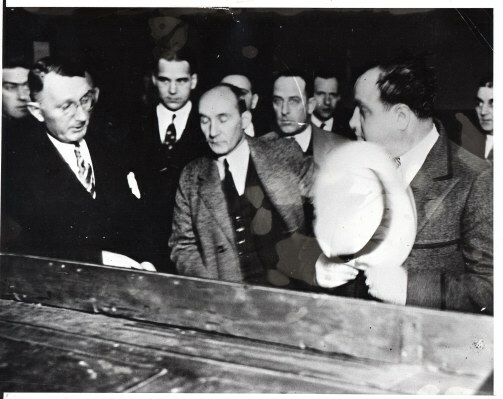 Capone stated that he was disappointed with Lingle, but not angry at him to the point of wishing him harm. 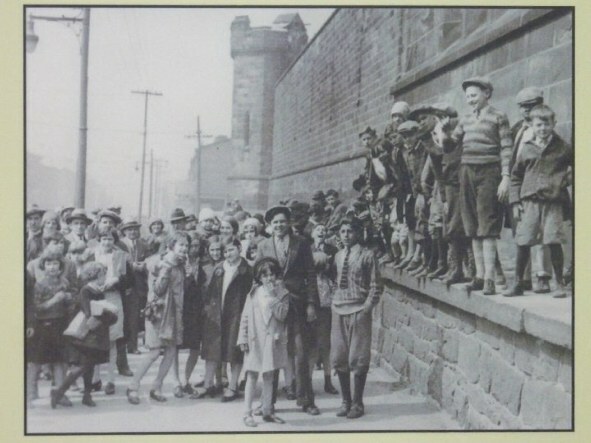 Capone followers and gawkers, among them many children looking for a glimpse of the famous gangster Al Capone. The streets were filled with the curious and reporters. The Warden knew that Al's release would cause a a great amount of hoopla, so he ingeniously had Al leave earlier and made the crowd believe he was still inside. After his arrest in Philly his mugshot was sent across all the states. This copy was sent to San Diego in California. 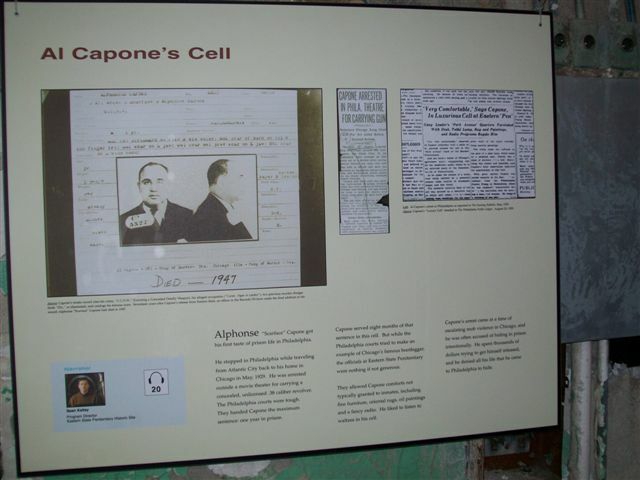 After nearly 11 months behind bars, Al Capone and Frank Rio were secretly transferred from the Eastern State prison in a brown automobile on the evening of March 16,1930, and held at a new prison situated at Gratersford, in the county of Montgomery. This was about 30 miles away from Eastern State. They were officially released on the 17th from that location and were already half way across the state when the huge steel door opened at the Eastern State prison. This 4 hours before the prison officials annonced the ruse. Hundreds of people along with press stood along Fairmont and stared for the exact moment the gang monarch would step out of it's front door. Even Alfred "Jake" Lingle was waiting to welcome Al out to freedom. The huge steel door finally opened. A guard peered his head outside looking both ways. From behind him appeared an Al Capone lookalike who sauntered out and passed the press. They quickly grabbed their cameras, but soon seem to think something was off as the gentleman walked by. Lingle is fuming because he realizes that Big Al, his buddy, has stood him up for an exclusive for his paper. Al is pissed at Lingle for conspiring with other gangs behind his back. Capone and Rio met up with Ralph Capone and Jake Guzik. To throw the press off their trail, rumors were put out there that Capone and party would take a chartered plane home or that they would take a train called the Broadway Unlimited and head for Pittsburgh. None of these rumors proved to be true. The party had probably just driven an automobile back into Chicago in order to avoid detection. Al finally made his way to Chicago where he stopped by to ask officials if he was wanted in connection with any crime? They all said no, and Al was now on his way to a welcome home party that was planned in his honor across the street of The lexington Hotel. 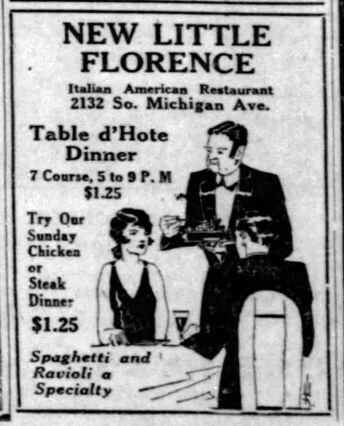 The rendez vous was at Little Florence restaurant that was closed off to the regular clientele for big Al's retrurn. Over 200 guests and family came to see Snorky. The main dining hall had been turned into a banquet hall with private booths turned into makeshift wardrobes with their connected tables forming a long dining board. Each table had on them a decorative bowl of flowers along the stretch of white linened tables gleaming with silverware. In the back was a makeshift bar served beer and champagne. Matriarch Theresa, sister Mafalda and Al's wife Mae Capone entered together. Ralph Capone with his wife and son Ralph Jr. then entered next. Al greeted his mother in Italian. While Theresa did not speak english she fully understood what people were saying. For that day she was dressed in black and only had a pair of diamond earrings with a gold wedding band on her finger. Mae was next to Al, with her brown hair streaked with gray from worry of Al being gone for those many months. With Al gone she had to deal with Mafalda's attitude and her place in the family. Mae kept a close watch on Al as he downed glass after glass of champagne. She frowned as he held a glass up to his lips but he just gave hera loving wink. Besides family there were politicians, doctors and lawyers. People such as Alderman William Pacelli, city sealer Daniel Serritella, Albert J. Prignano, lawyer Tyrell Richardson, Dr. David Omans. All had brought their wives. Also in attendance were Jake Gusik, Dennis Cooney, Tony "Mops" Volpe, Jack McGurn, Danny Stanton and Rocco "Rocky" Fischetti. Phil D'Andrea who was Capone's main bodyguard had a special cake made for his boss. It was laden with pink roses. Everyone clapped but not to be outdone Al's mother Theresa had an even more special cake made. It was an enormous white cake written with pink icing across it. The words read "My son, your Mother welcomes you home". Al immediately embraced and kissed his mother. The entertainment consisted of a trio band that broke out into that year's hit called "A great big man from the South". After the entertainement stopped for break, everyone cheered Al on to make a speech. Al laughed got up from his seat with his champagne glass in hand. "Folks, I don't know what to say except -- Good Luck!" Everyone drank to the toast and gave out a burst of applause. 5342 W 22nd. 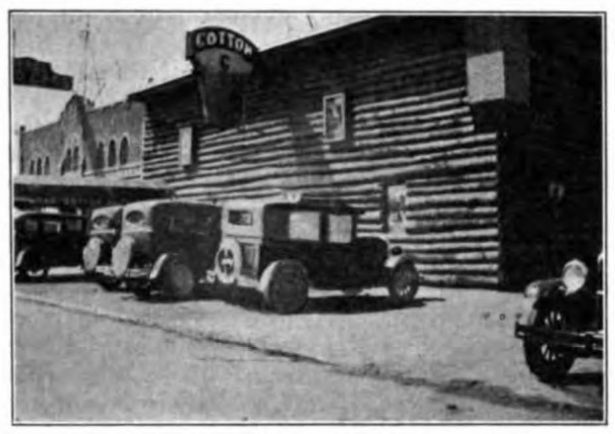 The Cotton Club in Cicero run by his brother Ralph. The club was right next to Bergl's automobile dealership. After the banquet over Capone had the remaining revellers driven to The Cotton Club in Cicero where they partied into the wee hours of the morning. Capone in the next days after the party left for Miami. 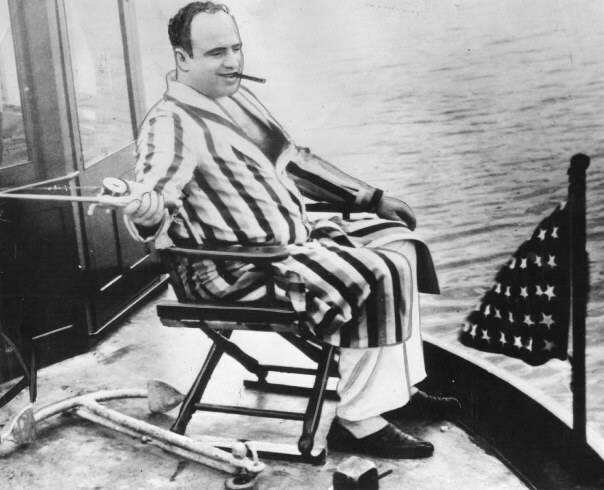 On April 20, 1930, a photograph taken of happy Al Capone can be seen fishing off the stern of his boat moored at the back of his Florida mansion. Often mistaken as Al Capone near the end of his life, this photo was actually taken on April 20, 1930 by The Chicago Evening American. Capone would soon make a trip to Cuba after this photo. 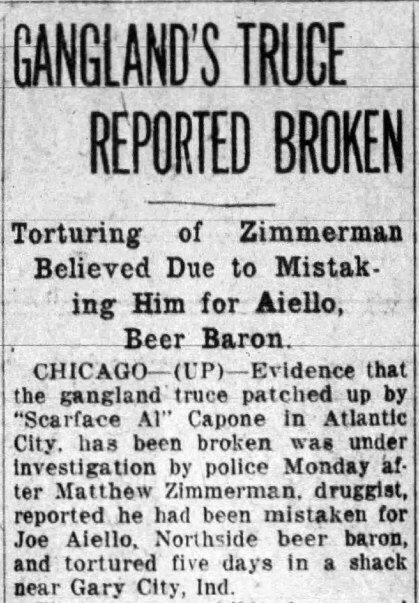 These series of events got Capone in deeper hot water when he claimed at the time that he was too sick to appear in a Chicago Federal court.